It is election day. Things are intense. CNN has been on since we returned from voting. I am a responsible citizen and I care about our future. But…I’m so tired of this election. I am worn out by the negative commercials. I am irritated by the amount of junk mail I’ve received. I can’t stand the political stalking of my house phone number. Apparently, before I returned from work, someone came to my door JUST to makes sure I planned to vote for Elizabeth Warren today. I am weary of all of the angry candidate bashing on Facebook. Enough is enough. So, I’m busting out a girly post here to lighten things up. Who doesn’t love talking about beauty products? Even better, who doesn’t love using a health and beauty product that is free of any cruelty to animals? In fact, I think I’ll turn this into a series on assessing what I have and how it rates in terms of cruelty-free-ness (or lack thereof). We’ve been a cruelty-free household for many years. There have been a few exceptions, such as the night we ran out of dishwasher soap and the only thing I could find was Palmolive or something like that at a late-night convenience store. There have been a few times that I’ve used bleach. I stupidly bought a large pack of Dove deodorant on a whim at Costco that I still haven’t used up. I also bought a Cover Girl mascara on the road out of desperation a few months ago. Oh, and toothpaste. I haven’t been able to find a natural toothpaste that has let me go 2 years without a cavity. However, when it comes to our laundry soap, kitchen soaps, hand soaps, anything soaps, make-up, shaving cream, hair stuff, shampoos, bath suds, cleaning products, and every other possible product imaginable, we’ve done a good job sticking to our guns. Or so I thought. Some further research tells me that I, the one who thought she was SO informed, was wrong about a few products. I have too many products floating around and I’m determined to simplify. Look at this! What a mess. 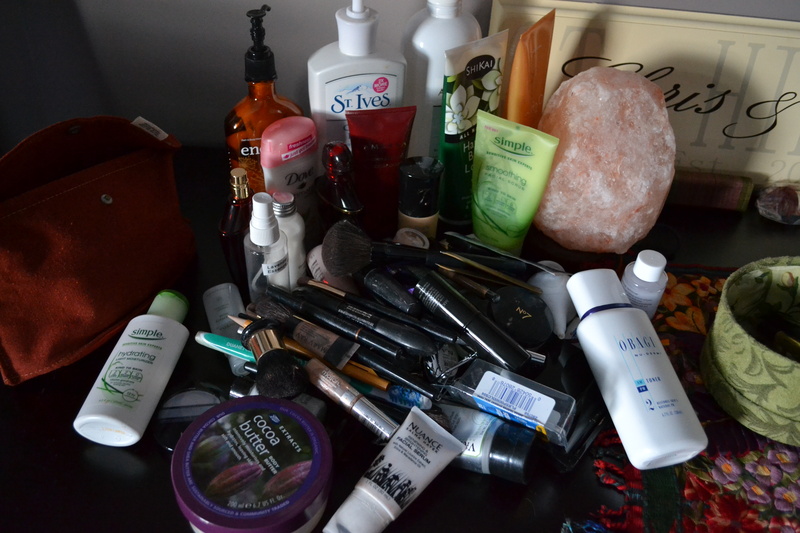 How does one woman end up with so many products? I’m starting with the gazillion body lotions I have piling up. Let’s assess. I loved receiving this lotion as a gift from my sister. It smells edible and it makes your skin shimmery, but not in an obnoxious way. Bonus: They focus efforts on preserving our oceans. My husband put this in my Christmas stocking because he loved the smell so much. It is a bit strong, but smells lovely and it is very creamy and non-greasy. Color reflect shampoos and conditioners. I’ve used the mist and go spray leave-in conditioner and the platinum color reflect conditioner and I endorse both. This is a UK-based company that offers every kind of product imaginable, from makeup to foot care.I did a little research and found that though Boots does not test their products on animals, they aren’t committing to using ingredients that have not been tested on animals. 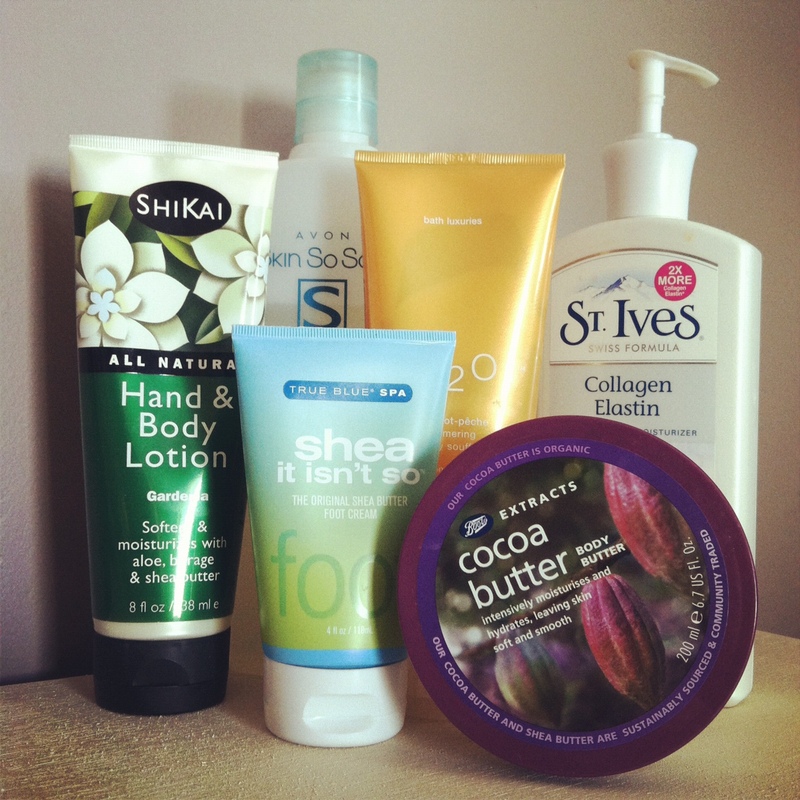 I’ve used many Boots products because they are easily accessible at Target and quite affordable. Other products to try? None. There are more ethical companies out there with products that are just as good or better and affordable. I’ve used this product for years because the packaging states “This product not tested on animals.” It is in every pharmacy and it is super inexpensive. The moisturizer works fine (nothing special) and I typically slather it on after a shower if I’m looking parched. Through further research, I learned that the company was purchased by evil empire, Unilever, and the line on the packaging has been removed. I will not be purchasing anything by this brand going forward. Other products to try? None. On the Peta bunny list? No. Avon is on the list of companies that do test. In fact, they got into a bit of trouble for making the claim that they don’t test on animals. Other products to try? None! On the Peta bunny list? Yes! This is an incredibly affordable and accessible brand that can be found in malls and strip malls all over. They are, of course, known for their heavily scented products. This shea foot lotion is wonderful. Slather it on under a cotton pair of socks for a few hours and your rough, dry feet will be transformed. Other products to try: I LOVE the smell of the Stress Relief (Eucalyptus and Spearmint) line, part of the Aromatherapy collection. I didnt know that about st. Ives. I do love h2o and shikai products. Like your blog! I checked out the Beauty by Britanie blog, and didn’t see anything about her being cruelty free. Maybe I missed it. Previous Posthappy Halloween and…a new sister blog!